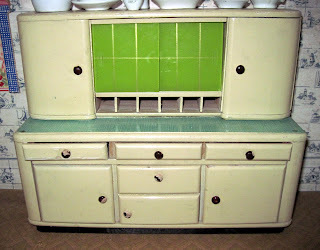 An antique German doll kitchen had long been on my wish list, and this past Christmas, Santa did not disappoint! 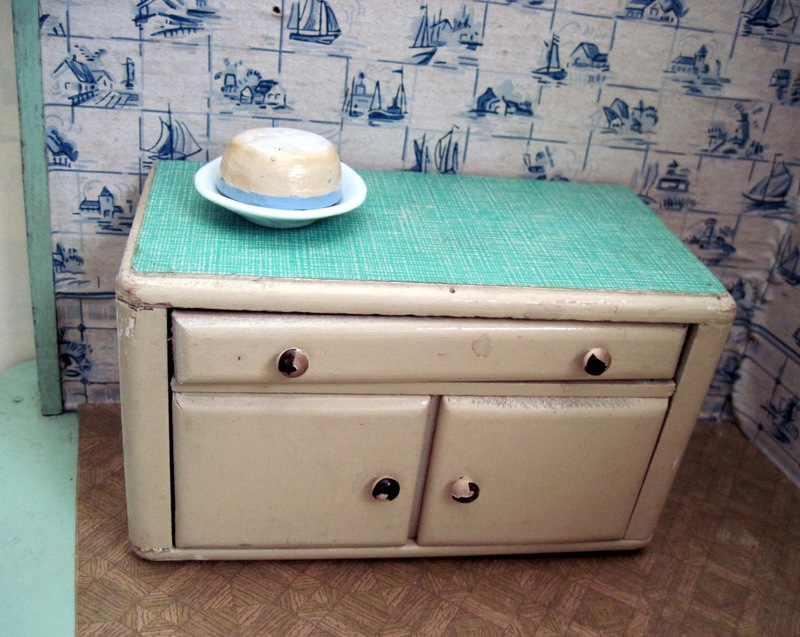 This 1930s example came complete with its original floor covering, wallpapers, and furnishings. I added some accessories and a dolly cook. Measuring a hefty 27 inches wide by 11 inches high, the scale is larger than dollhouse, sized more for actual doll play. The kitchen is a delightful combination of classic Dutch kitchen decor and 1930s Art Deco styling. The kitchen cabinet has wonderful Deco curves, a paper "linoleum" counter top, drawers that open, and real glass sliding doors. 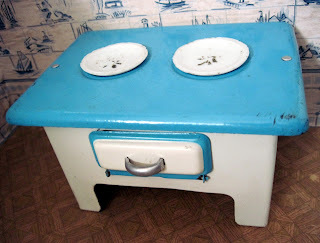 The little blue and white stove is adorable, and the door opens. I added the china plates to cover the burner holes; they are much older, circa the mid 1800s, but fit perfectly. 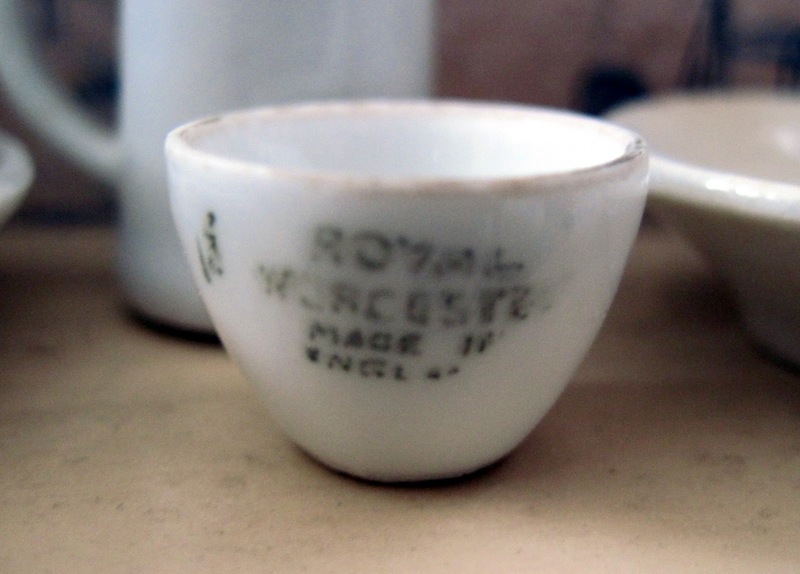 One of my most loved accessories is now in the kitchen: this tiny (1/2 inch tall) Royal Worcester pudding bowl, made in England in the mid 1800s. The piece is so very small and fragile, it's amazing to me that it survived. My china doll seemed to be the perfect match for this kitchen, in her color coordinated dress. She's looking forward to trying out the pudding bowl. The doll kitchen is a very old and traditional German Christmas gift, dating all the way back to the 1700s. In her wonderful book, Doll Kitchens, author Eva Stille explains that doll kitchens would be brought down from the attic each Christmastime by parents who would freshen them up with more grocery supplies, a new pie plate or two, and a bright new coat of paint. All winter, the kitchens would entertain the family's children, until with the warming spring weather, the toys, now depleted of provisions, temporarily lost their interest. They would be packed back up and returned to the attic as the children moved their play outdoors, only to be brought back down once more, restocked, and placed under the tree again the next Christmas. The toys were usually passed down through several generations. Stille gives an example of an 1885 doll kitchen ordered by a wealthy family in Bregenz. 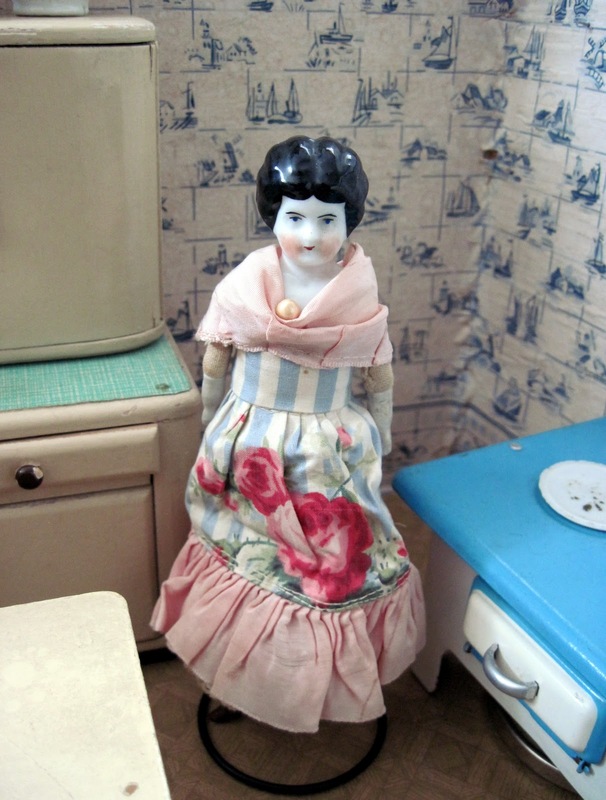 The toy was passed down among girls in the family all the way to 1979, when it was bequeathed to the most recent descendant, who was still playing with it at the time of the book's publication in 1988! 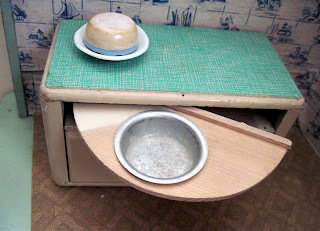 I feel very fortunate to have finally received my own doll kitchen for Christmas.